Like a poached egg, burrata is a white pocket full of deliciousness. Like a poached egg, burrata is a white pocket full of deliciousness. When you cut into burrata’s skin (which is mozzarella cheese, by the way), it oozes fresh, sweet cream and strands of more mozzarella instead of a runny yolk. Here are seven ways to use this incredible cheese. Make burrata seem even creamier by pureeing it with milk and olive oil. 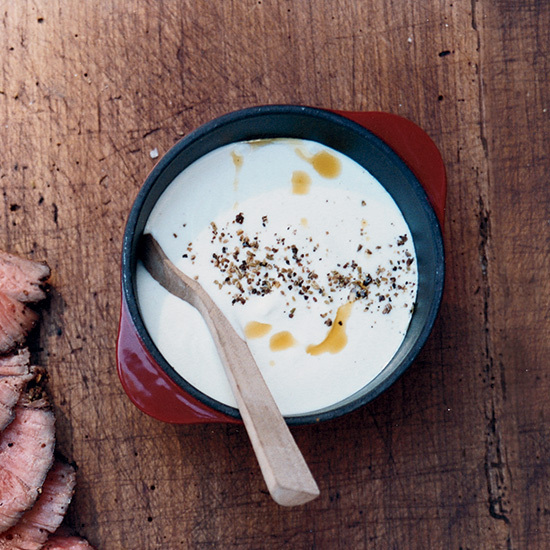 A hit of lemon juice turns it into a creamy-tangy sauce that’s spectacular over grilled meats. Serve burrata Mario Batali style and set it over speck (a smoked Italian meat) with a lemony pea salad. Turn cucumbers and radishes into a full meal by serving it with burrata. Make any vegetable bruschetta more luscious by topping it with a piece of burrata. Whether you make a light and lovely veggie pasta or one that’s more earthy and spicy, you can’t go wrong by adding burrata. Make the world’s most decadent toasted sandwich with, you guessed it, burrata. Add some bacon, romesco or pesto for good measure. Fold the cheese in an omelet just before it’s done cooking, letting the residual cheese melt it.